Troubled professional. 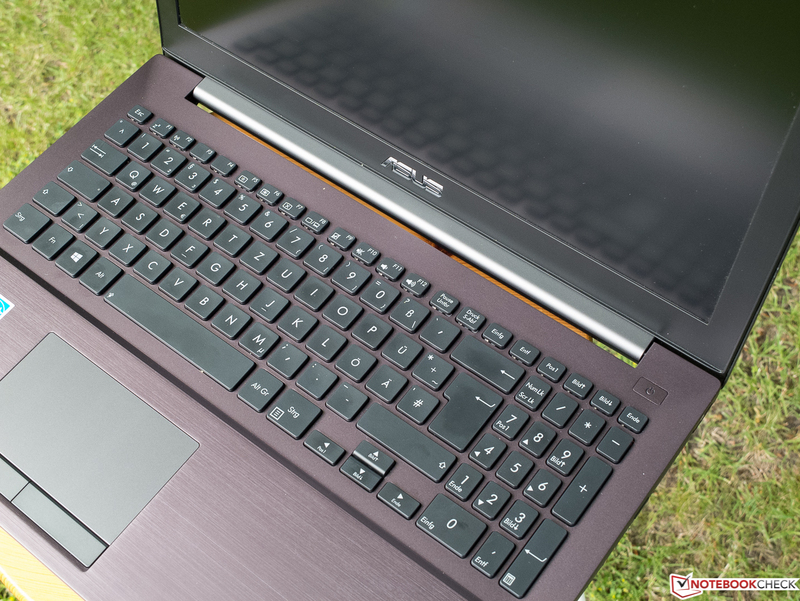 Asus' new Pro laptops are aimed at business professionals - integrating a lot of security features - while also being multimedia powerhouses with a DVD burner and the new GeForce 840M GPU. Unfortunately though, the Taiwanese company has failed to meet its own quality requirements, forcing us to repeat some of the tests with a second Pro B551LG device. 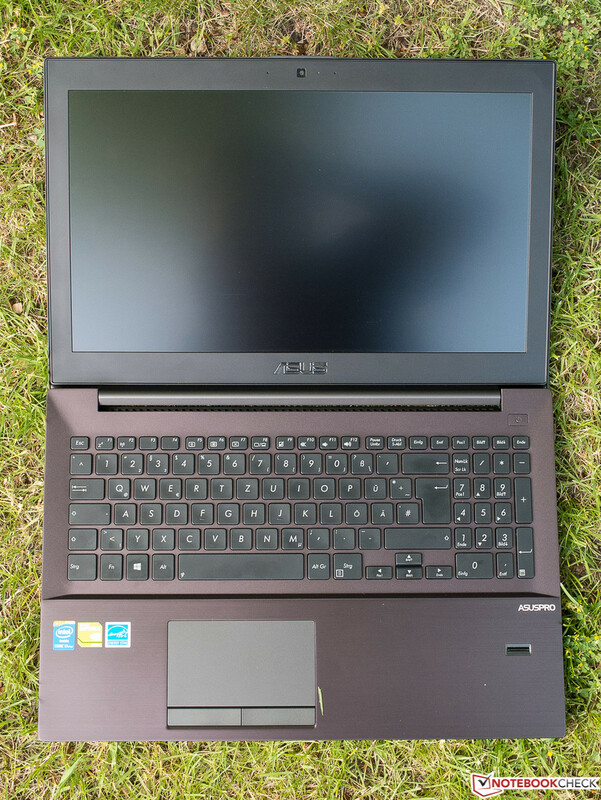 A lot of potential but unfortunately tons of quality issues: The Asus B551LG. Having a look at the specs of the device, there's much to fall in love with: A fast Core i7 CPU, a matte Full HD IPS display and the new Nvidia GeForce 840M. 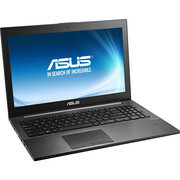 Still, this is not just a multimedia laptop, being aimed at "mobile business professionals" (according to Asus). Lots of security features, a docking port, dual-band Wi-Fi, an ergonomic keyboard and Windows 8 (or 7) Pro emphasize this statement. 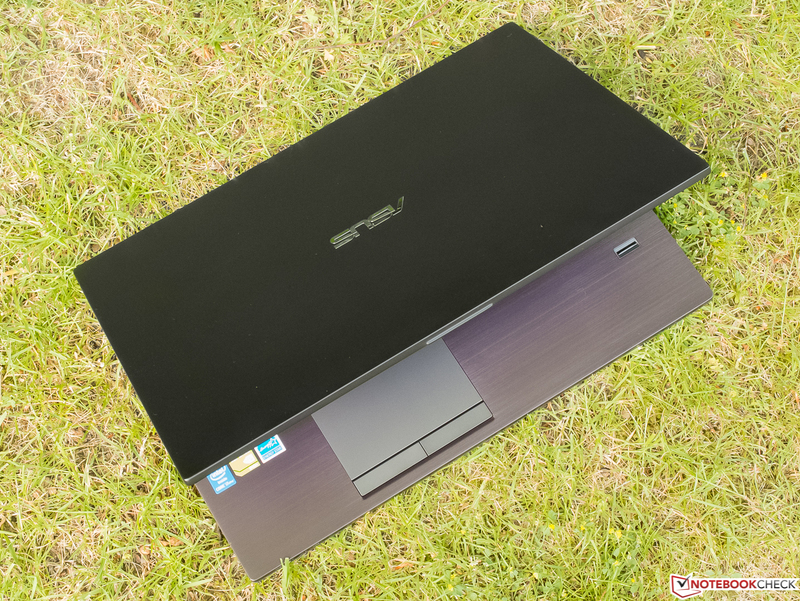 "Professional quality" seems to have been paramount to Asus, as it even mentions on the side of the device that "...it has been built and tested in order to easily exceed common industry standards in terms of quality, sturdiness and reliability." Let us see whether this works out as planned. Since professional business features and multimedia capabilities are rarely ever combined in one device, none of the other laptops we compare it to are direct competitors. Still, we want to compare the different CPUs, GPUs and mass storage devices. 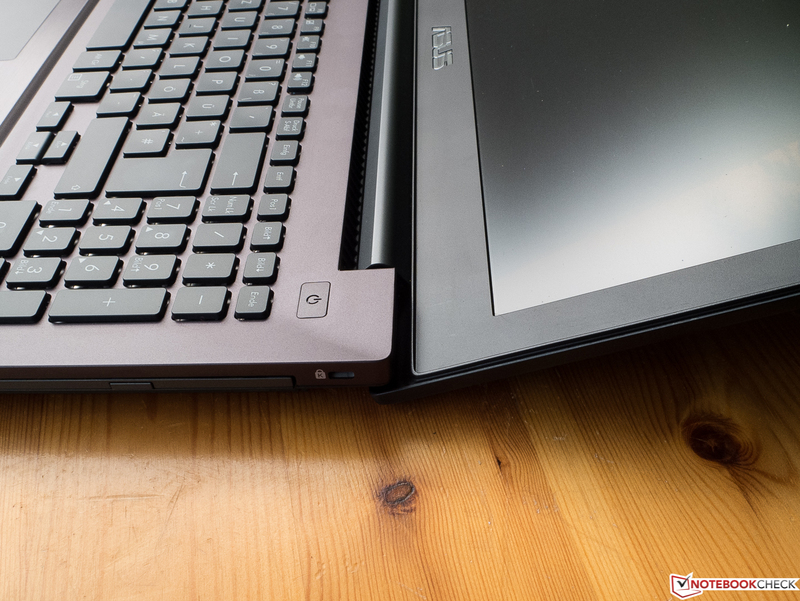 In addition, we want to present two alternatives in the 15.6-inch segment, one of them much more expensive and the other noticeably cheaper than our test device (which costs around 1250 Euros, ~$1707). For 1600 Euros (~$2184), the HP EliteBook 850 G1-H5G44ET with a matte Full HD display (albeit of the TN variety) can be had, including a Intel Core i7-4600U CPU (2x 2.1-3.3 GHz, Hyper-Threading, TDP of 15 watts) which barely differs from that used in the Asus laptop. The HP machine ships with an AMD Radeon HD 8750M, a slim design and a rather low weight of 2 kg, while the Asus Pro weighs 2.5 kg. 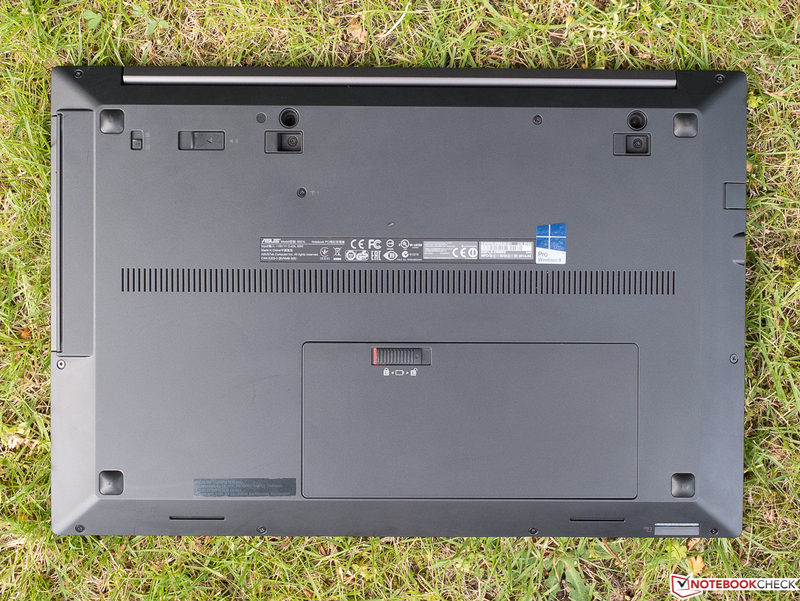 The last of the three, the Lenovo ThinkPad S540 20B30059GE, weighs 2.1 kg, sporting an Intel Core i5-4200U (2x 1.6-2.6 GHz, Hyper-Threading, TDP of 15 watts) and again a matte TN-based Full HD display. While it costs just 900 Euros (~$1229), it is the only one of these devices shipping with "just" a conventional HDD plus SSD cache instead of an actual SSD. 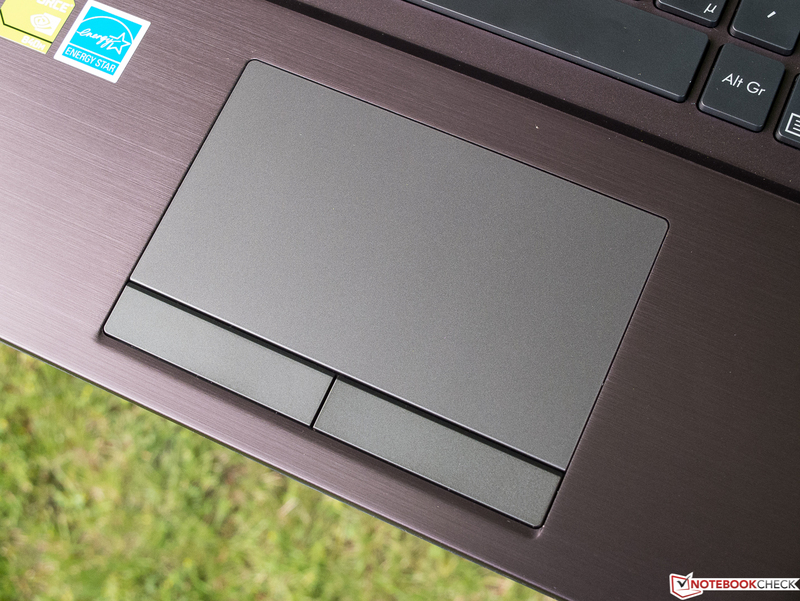 Both the Lenovo and HP laptops ship with a number of security features (fingerprint reader and/or TPM chips plus SmartCard readers) as well. The chassis has been made from aluminum and plastic, neither leading to a premium impression nor to exceedingly cheap looks. Its boxy, minimalistic shape is quite functional. 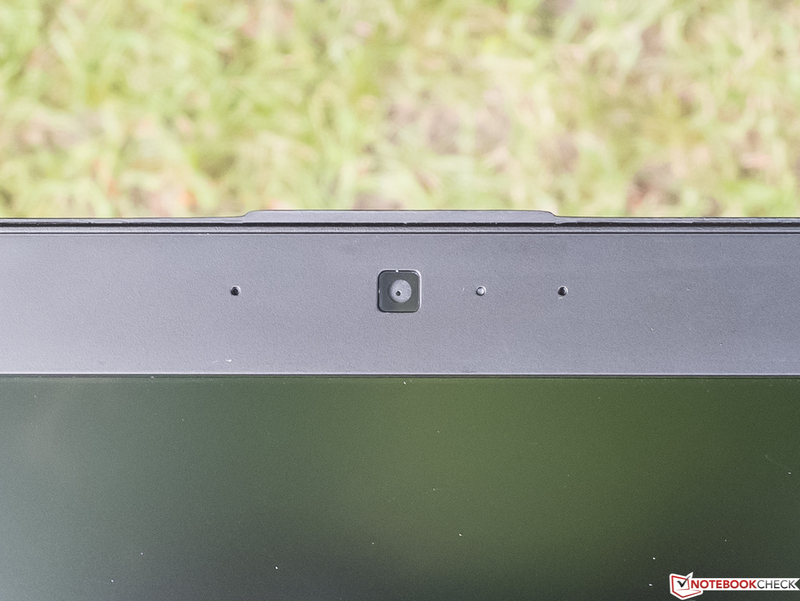 While the display lid made from matte, black plastic - the same material used for the display frame - reinforced with carbon (according to Asus) may be quite flexible, it is pressure-resistant. 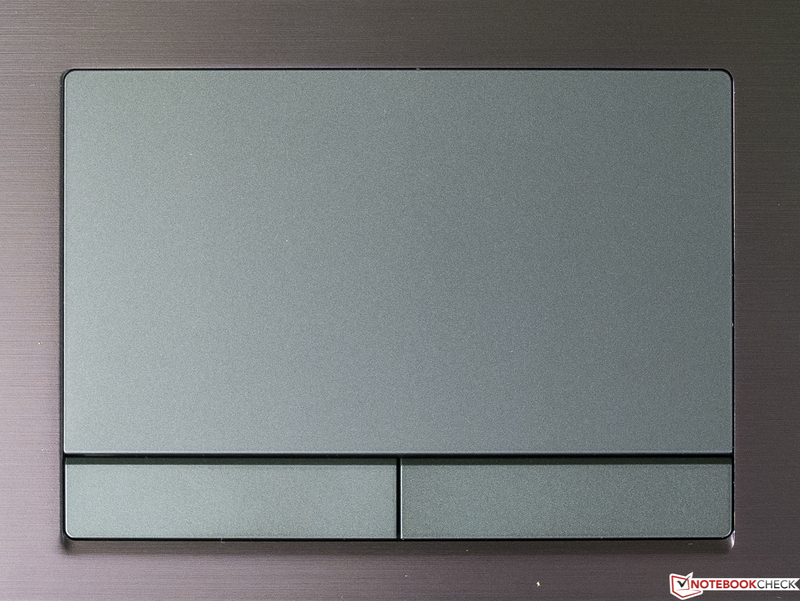 A nice change in terms of design is offered by the upper part of the base unit due to its anthracite-colored surface which has been lowered at the location of the keyboard deck, with a (fingerprint-prone) brushed-metal surface in front of that. Luckily, the device is easy to open with just one hand. Plus, the lid doesn't wobble. The base unit shows quite some torsion resistance (due to a magnesium frame inside) without yielding any creaking noises. The fan vents are directly in front of the hinge, making it hard to cover them up. The overall build quality is decent, with some irregularities such as misalignments between the lower and upper parts of the base unit, leading to sharp edges there (see above) which can be felt and seen. The innards are only accessible when the lower part of the base unit is removed. Unfortunately, unscrewing the 19 screws (of differing lengths, which makes it harder to be put back together again) voids the warranty. At least the battery can be replaced without disassembly of the entire device. The chassis of our test unit was a bit distorted, leading to a "floating" left foot to the front. While this got a bit better over time, it never went away entirely. Luckily, our control device wasn't plagued by this issue. Lots and lots of ports! Next to the usual ones, a DisplayPort jack and a SmartCard reader have been implemented as well. Even the undead oldie - VGA - is still on board. 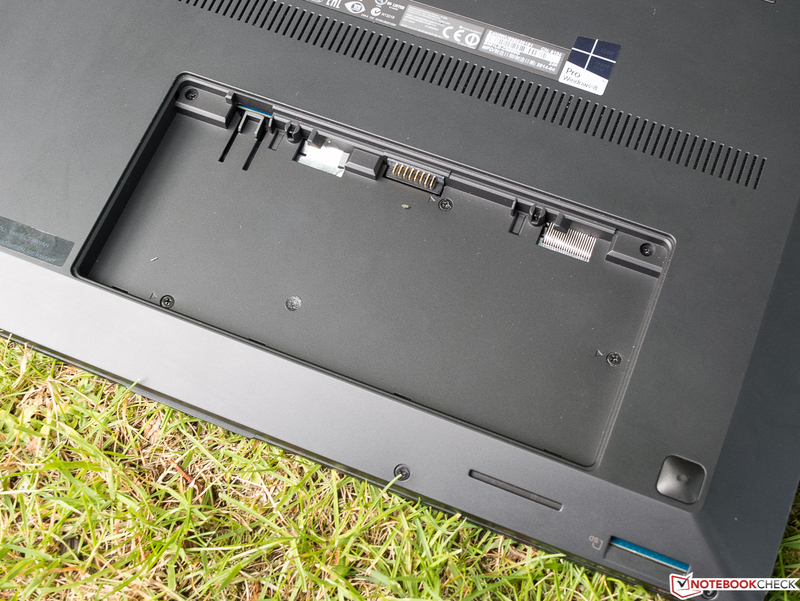 The DVD burner is placed at the rear end of the right-hand side, thus forcing the remaining ports further to the front (where they might become a nuisance). On the left-hand side, the other ports are spread over the entire length of the device. 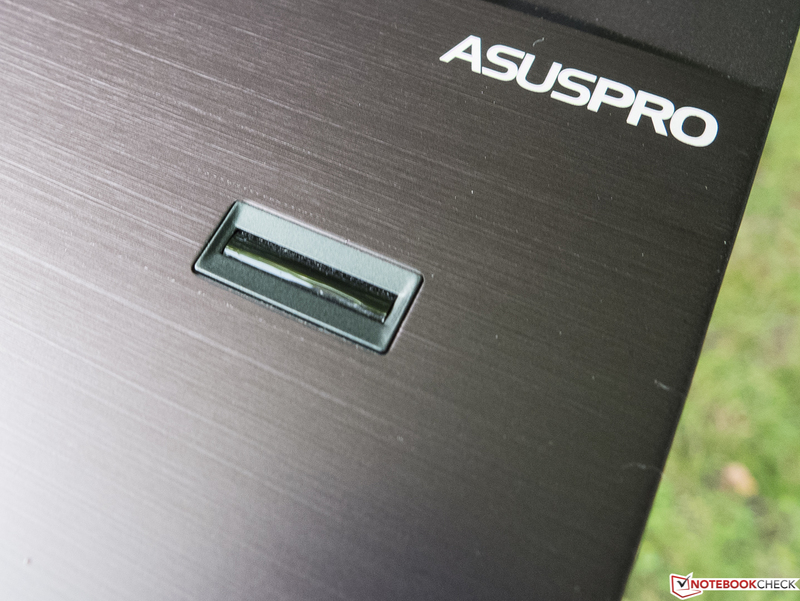 According to Asus, the device can be connected to the AsusPro Ultra Docking Station via a docking port at the bottom of the device, but we couldn't find any more information about that at the time of writing. The USB 3.0 port at the rear of the left-hand side sometimes lost its connection to an external USB 3.0 HDD, immediately re-connecting to it in the process. This problem didn't occur with the other USB ports (or other laptops, for that matter). Our second test device didn't come with this peculiarity. Our laptop didn't come with either UMTS or LTE, although such models are supposed to become available in the future. The Intel Wi-Fi module being used is capable of transmitting via the 2.4 and 5 GHz bands (with the usual IEE802.11n standard) as well as via Bluetooth 4.0, but it doesn't offer "Gigabit Wi-Fi" (ac). During our non-standardized real-life test, reception quality was slightly subpar. While two walls and eight meters between the laptop and the router didn't decrease the signal strength, the connection speed decreased a bit faster with distance than for most other laptops which had been tested before. 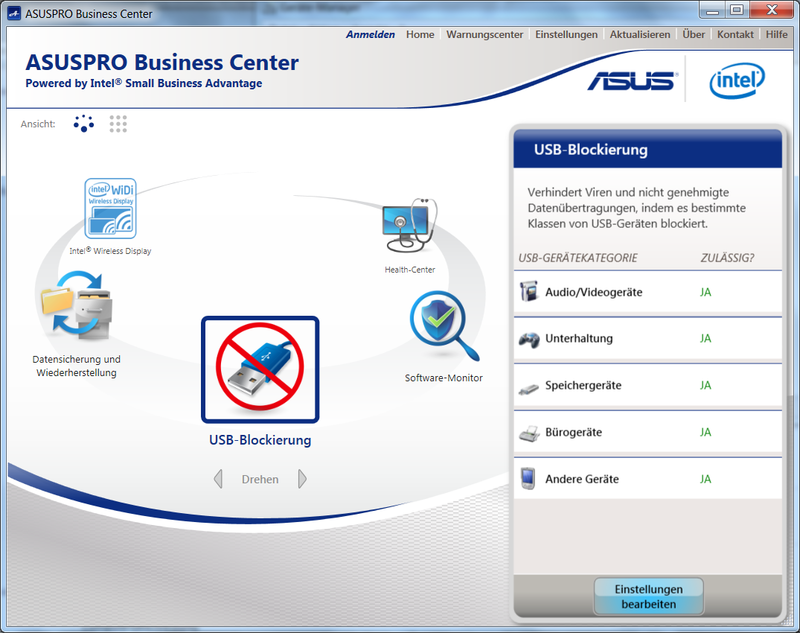 Asus offers a number of security features: USB blocking via the AsusPro Business Center (pictured), Shockshield HDD protection, a TPM chip (v 1.2), an RF fingerprint reader, a SmartCard slot, HDD encryption, Intel's Anti-Theft technology, Computrace LoJack (remote locking and data deletion as well as localization) and - according to Asus - increased shock protection for the entire device. Next to the warranty sheet, a "user guide" (just a single sheet of paper) and Windows 8 recovery disks, nothing could be found in the box. Care has to be taken to quickly make a recovery copy of the preinstalled Windows 7 version if this is to be used in the foreseeable future. Asus offers 24 months of warranty (as can be seen by a sticker on the back of the device) which holds true all other legal requirements notwithstanding. 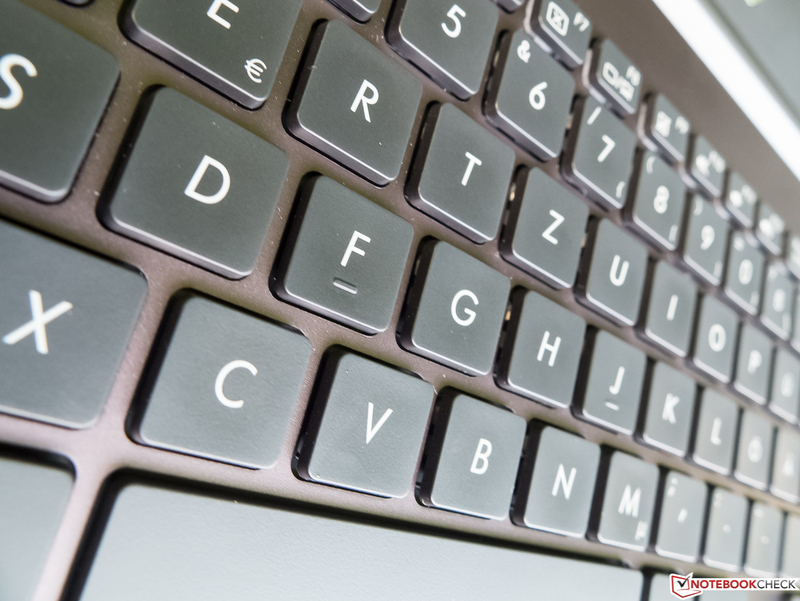 A warranty extension to up to three years can be had online for around 75 Euros (~$102). Asus makes use of the not-at-all-slim chassis of its laptop to include an amply sized (and water-resistant!) 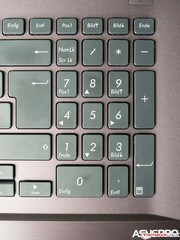 chiclet-style keyboard with a numpad and nicely long key travel when compared to most laptop keyboards out there. 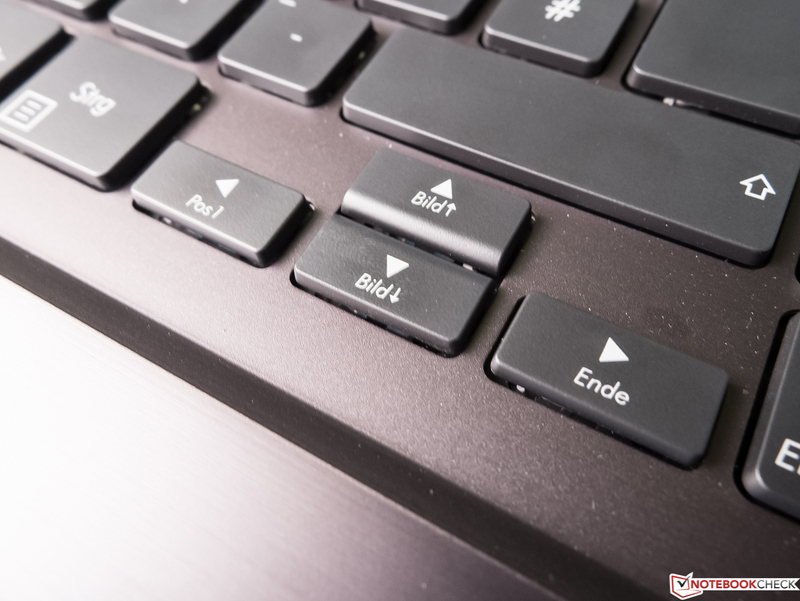 The slim, rubberized keys come with a decent pressure point which is achieved somewhat before rock bottom (in terms of key travel) is reached, leading to a less tiresome typing experience. Another plus: All keys (except for the larger ones) are rather quiet. 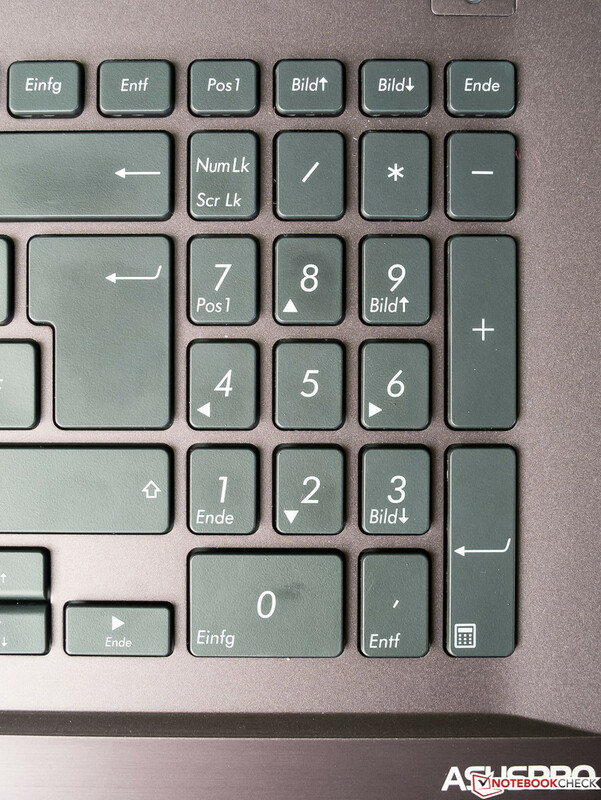 Although there is a separate numpad for blindly entering large amounts of data into the system, the numpad is too small, leading to an easy cramping of the right hand when using it for prolonged periods of time, making it harder to type without looking, too. While this may not hold true (after some time) for men and women with smaller hands, the author of this article tried (subconsciously) not to use the numpad too much. Irritating: The combination "Fn + Wi-Fi" and the combination "Fn + Bluetooth" often didn't work on our device, requiring an actual reboot. Our control device didn't have these issues. 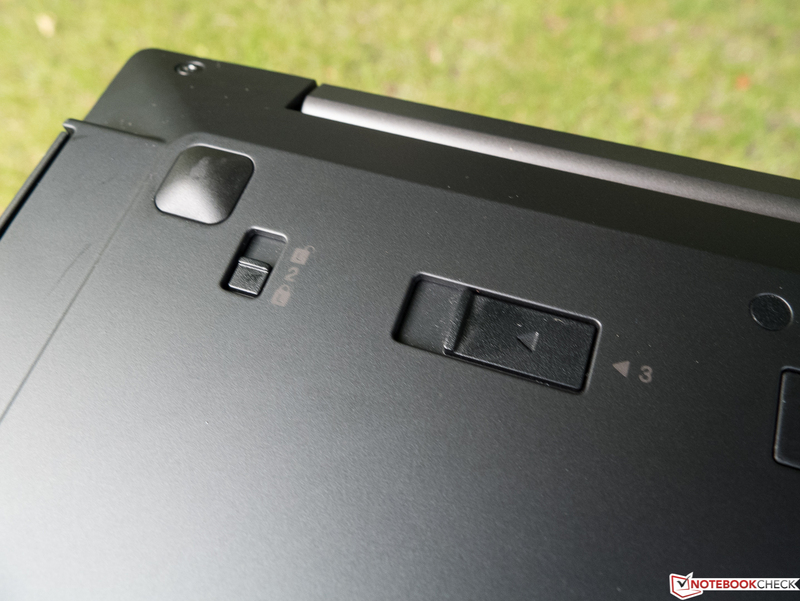 Opponents of the ClickPad currently en vogue will be happy to hear that Asus has decided in favor of a conventional touchpad with separate keys. Its large-enough surface has been roughened slightly, not registering any input close to its edges. The mouse buttons are easy to hit, yielding good haptic feedback and a comfortable level of resistance. Precision and reliability were decent. 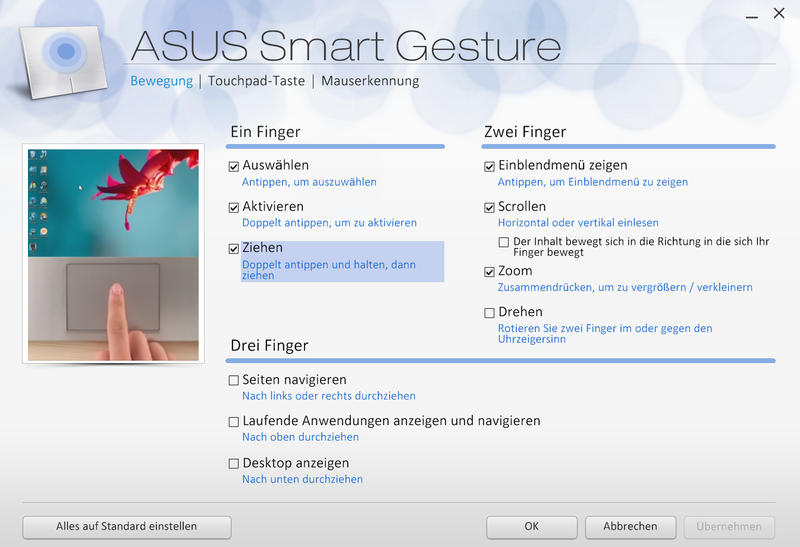 The Asus Smart Gesture software (pictured) allows the user to comfortably define a number of gestures for up to three fingers. Presumably, for Windows 8 these will include the edge gestures such as the one for the charms menu. 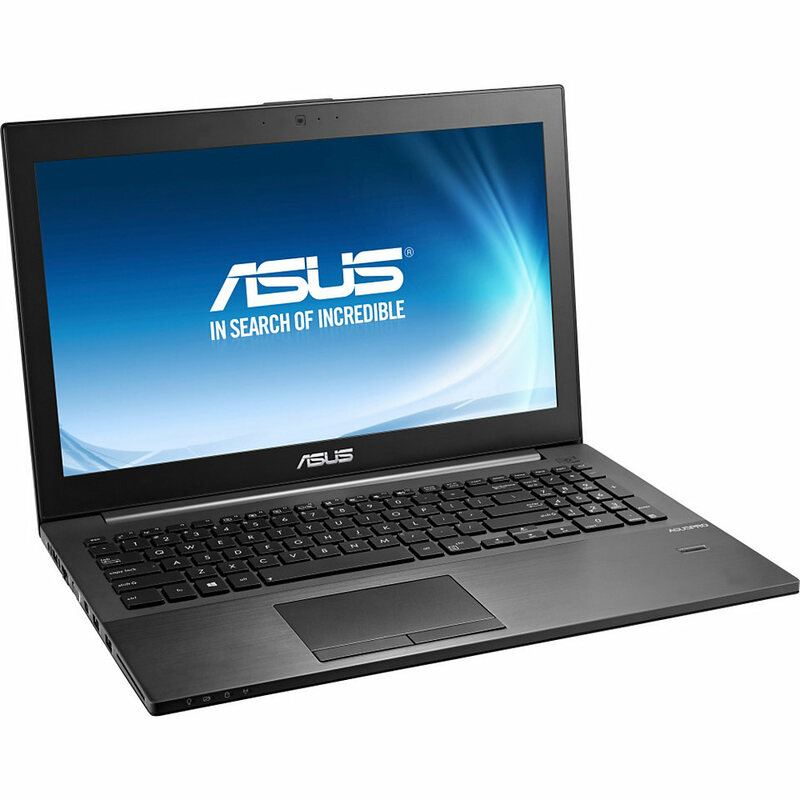 The Asus laptop comes with a Full HD display with an aspect ratio of 16:9, yielding 141 dpi on its 15.6-inches. With this resolution, the "ideal" human eye can still make out single pixels from a distance of half a meter, but in real life, there is nothing to complain about. Even small fonts are rendered in a crisp and sharp manner. The matte surface fits the needs of business professionals while the used IPS technology leads to a good contrast ratio and great viewing-angle stability. 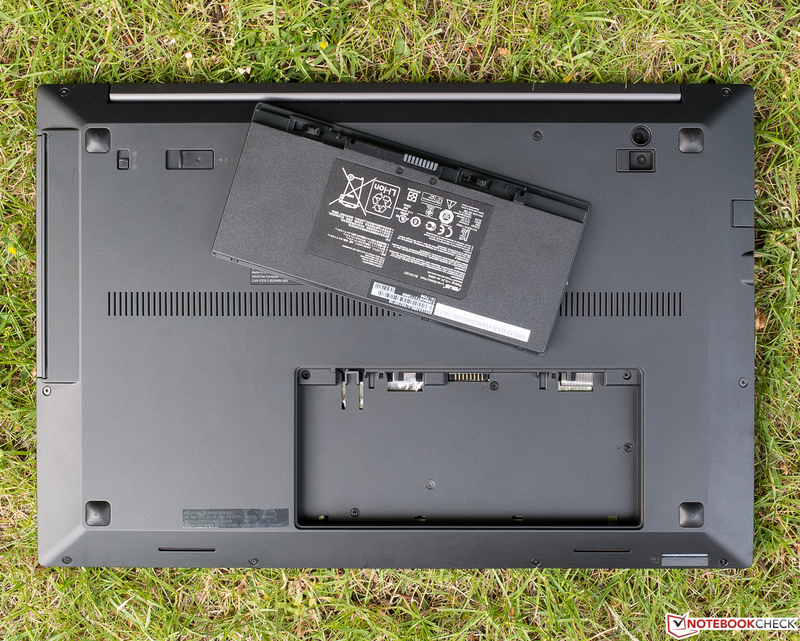 The maximum brightness of 328 cd/m² is quite high, and more than that, it can be sustained even while running on battery (most other laptops fare worse by 15 to 20%). Brightness homogeneity levels of 90% are superb, leading to almost homogenous blacks without any noticeable screen bleeding (at least subjectively). Even the black levels are quite decent, yielding 0.38 cd/m². 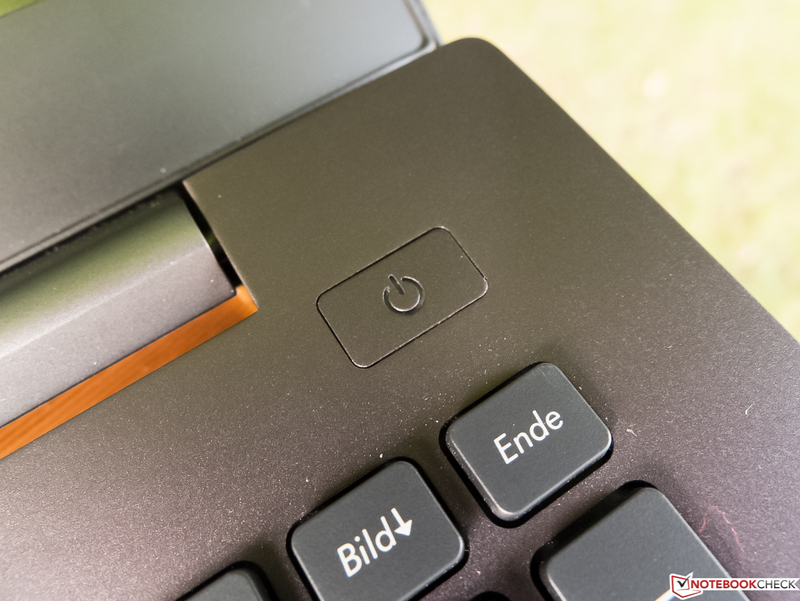 Together with the high brightness, this leads to a more-than-decent contrast ratio of 863:1, more than twice as much as for the HP EliteBook 850 or the ThinkPad S540. 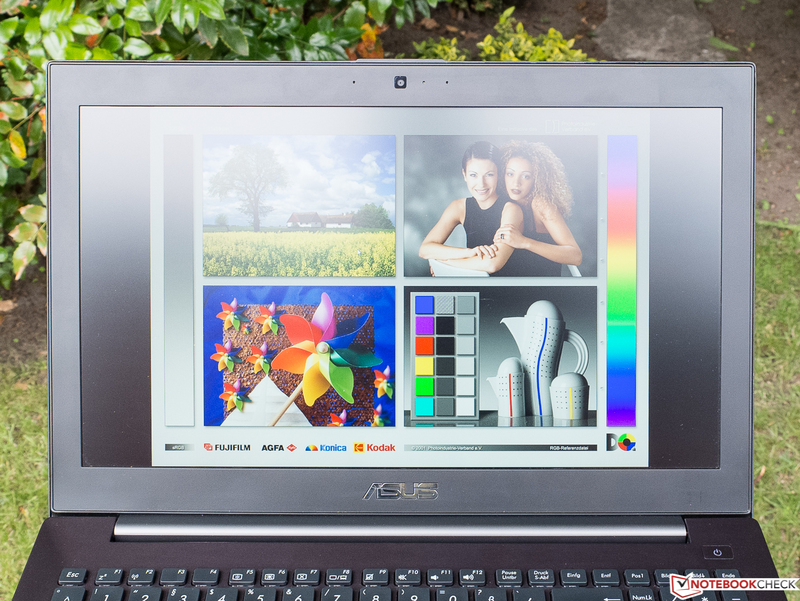 In terms of color accuracy, the Asus device is the only one to stick close to what it should achieve, yielding good DeltaE values of 4 (ColorChecker) and 5 (grayscale), which even for an IPS panel marks a respectable achievement. Both competitors yield far higher values of 11-13, leading to a noticeable bluish tint (prior to calibration). 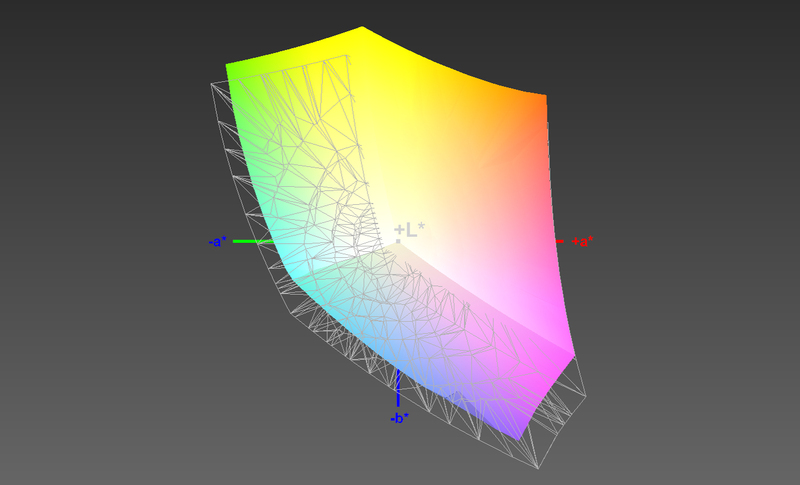 Also, in terms of color space rendition, the more expensive IPS technology proves to be superior: 63% of the large Adobe RGB color space (only relevant for graphics professionals) is quite a feat, even for an IPS display, with the TN panels of its competitors only reaching 47 and 48%. ...a lot of flexibility outdoors. 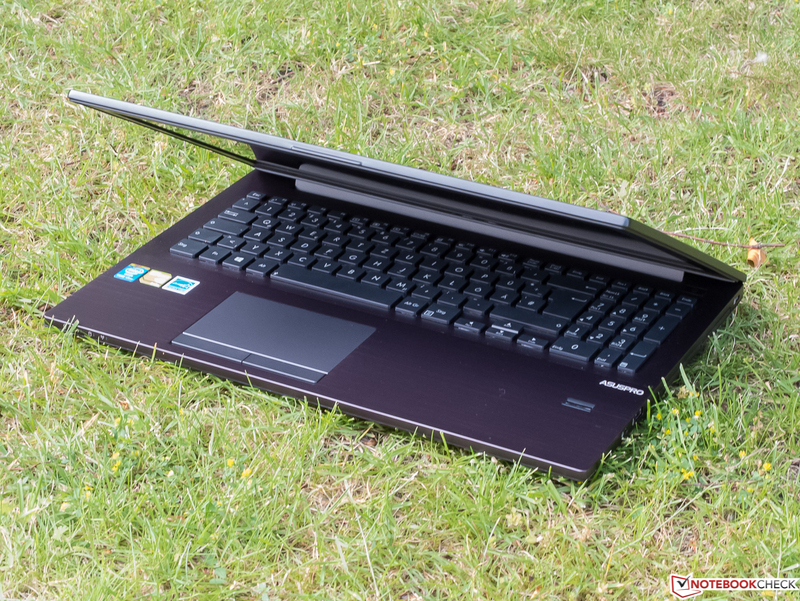 The matte, bright screen allows the laptop to be used outdoors with ease, even when bright areas such as the sky are reflected in the screen. 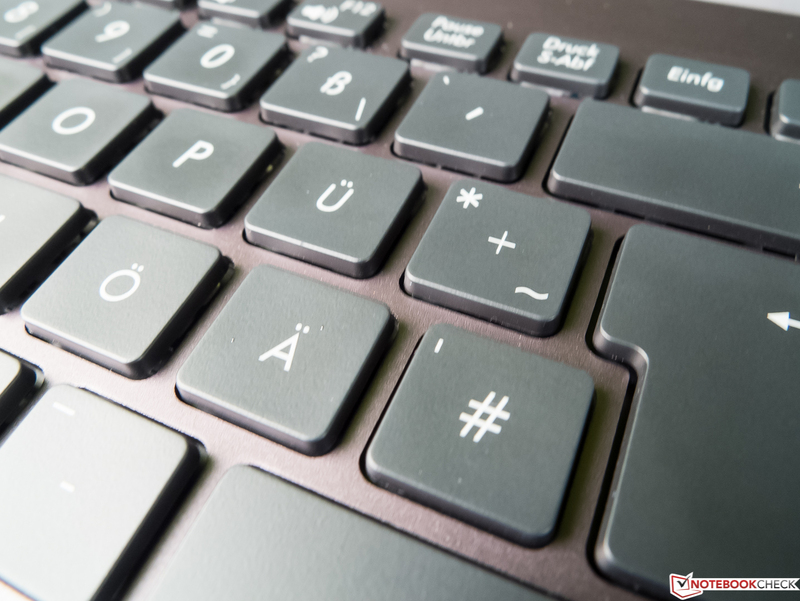 In contrast to many other laptops out there, it is hard to find a position where the screen is actually not readable, rather than the other way around. 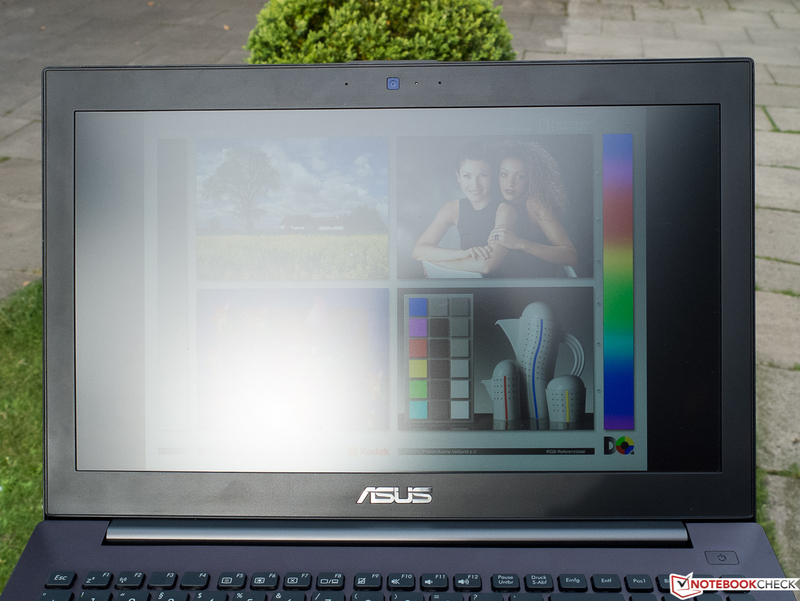 Of course, direct reflection of sunlight is too much, even for the Asus laptop. Apart from that caveat, our test device is perfectly suited to being used outdoors. Viewing-angle stability is yet another strength of the display of our test device. No inversions or misrepresented colors (as are common with TN panels), no matter whether horizontal or vertical deviations are examined, with just some minor brightness and contrast loss. This only changes once both horizontal and vertical angles are combined, but even then, the resulting issues are far less significant than with TN panels. Even several people can use the device at once. A fast ULV dual-core CPU - the Intel Core i7-4650U (2x 1.7-3.3 GHz, Hyper-Threading, TDP of 15 watts) based on Intel's most recent Haswell architecture - is used in the Asus laptop, capable (in theory!) 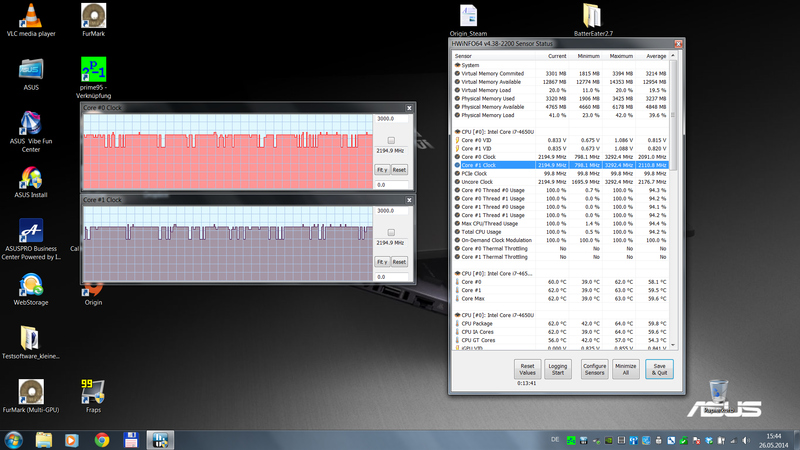 of holding up to 2.9 GHz with both cores under load. Even demanding tasks such as image processing or HD video editing should pose no problems (the only exception might be massively parallel programs such as those used for 3D rendering, where more cores would lead to strong benefits). 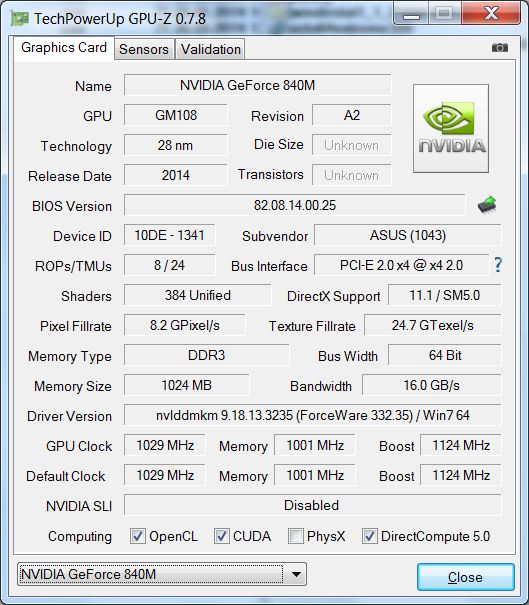 Having a look at the gaming performance, the CPU should rarely ever limit the mid-range GPU being used, an Nvidia GeForce 840M. 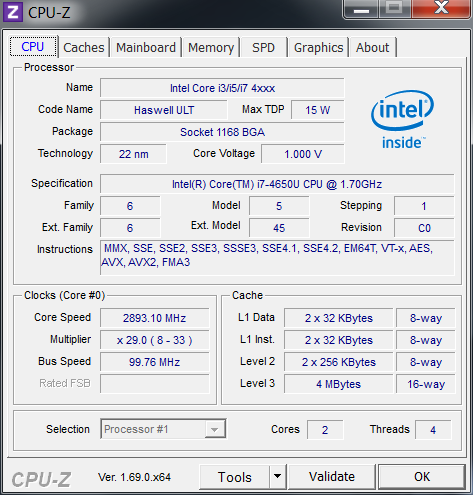 Like its preceding Ivy Bridge generation, Intel Haswell CPUs are made via a 22 nm process, coming with just slightly better performance levels yet much-reduced power consumption. 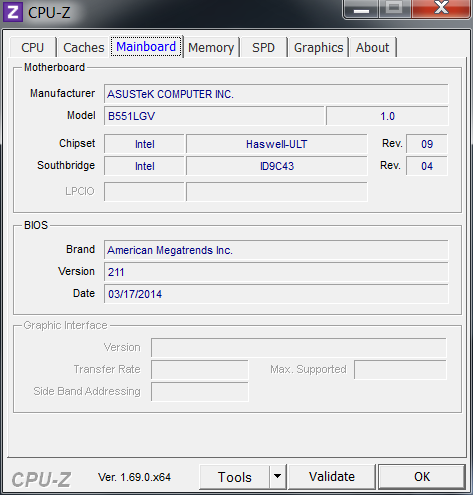 For those programs which make use of Haswell's new command extensions, noticeable performance boosts are possible. Our CPU tests via the Cinebench R11.5 (multi-core) benchmark lead to subpar results, no better than the nominally weaker Intel Core i5-4200U (2x 1.6-2.6 GHz, Hyper-Threading, TDP of 15 watts) used by the ThinkPad S540, even when utilizing both its cores. It should, however, be almost on par with the i7-4600U (2x 3.1-3.3 GHz, Hyper-Threading, TDP of 15 watts) used by the EliteBook 850-G1 which is 16% faster in these benchmarks. The explanation for this low multi-core result? 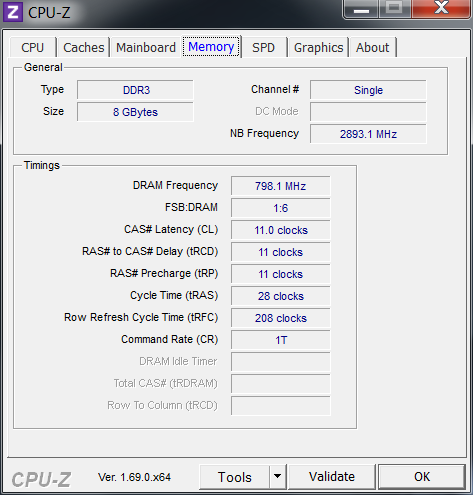 The clock speed is the culprit, being reduced from 2.9 GHz to a maximum of 2.3 GHz (and sometimes even less). For comparison: The Intel Core i7-4600 used by HP manages to reach 2.6 GHz (and for prolonged periods of time), only throttling down to these levels after approx. 30 seconds. 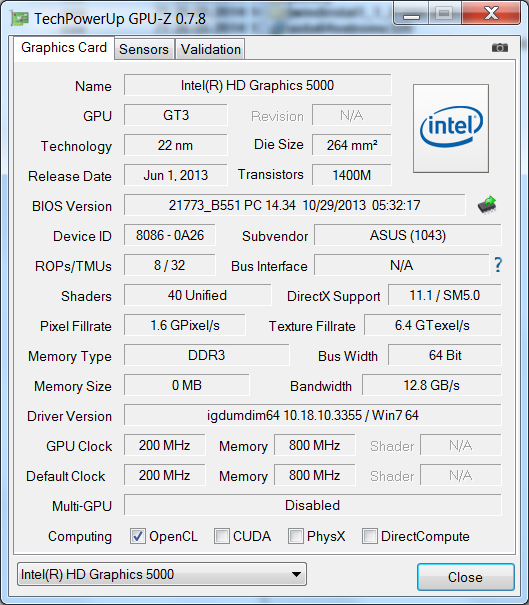 Our control device - also an Asus Pro B551 laptop, but with the i5-4200U CPU - actually reached the same multi-core results as the i7 variant, due to being able to hold the same 2.3 GHz. At least during the single-core test of Cinebench R11.5 is the i7-4650U capable of beating its i5-4200U-equipped colleague, but it still fares worse than other devices with a comparable CPU. Thus, its performance is subpar compared to its capabilities and to the competition. While this may not always become apparent in real life, it can nevertheless be disappointing for those choosing the i7 variant due to its extra performance. One nice aspect: We didn't notice any differences while the device was running on battery. System performance measurements not only include the CPU but also other aspects such as the RAM, the GPU and the mass storage device, which differ in their influence depending on the synthetic application scenario being tested during the PCMark 7 benchmark. 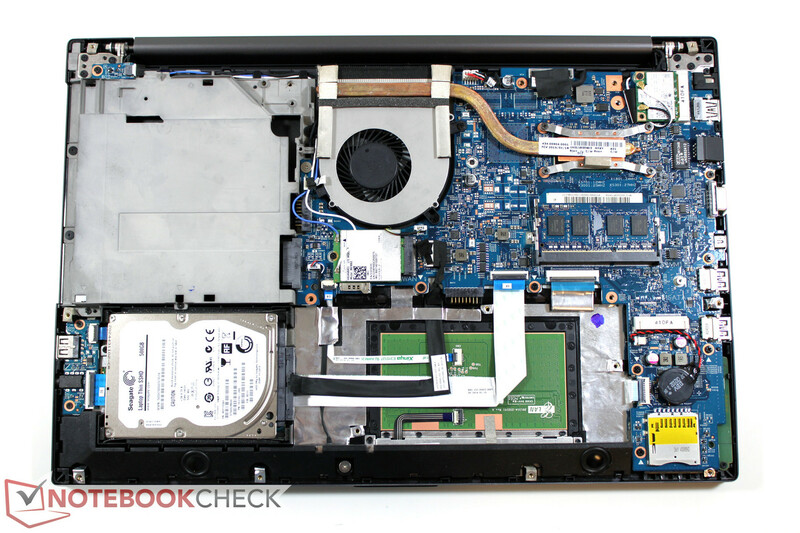 While our test device is capable of beating the ThinkPad S540 by 20 to 30% in each and every category, the latter is the only device with just an HDD (plus a 16 GB SSD cache). 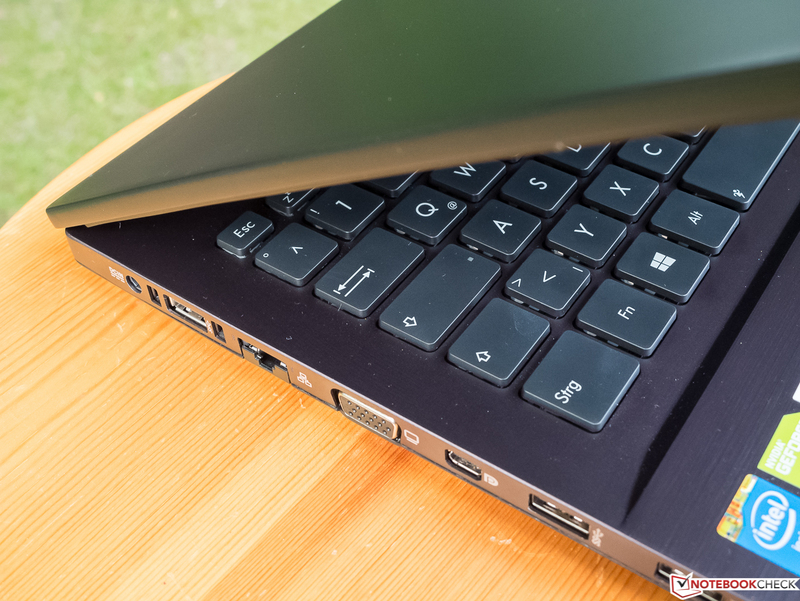 The Asus laptop should in theory be on par with the HP, but it loses once more - not only due to its throttling issues, but also due to its rather sluggish SSD. 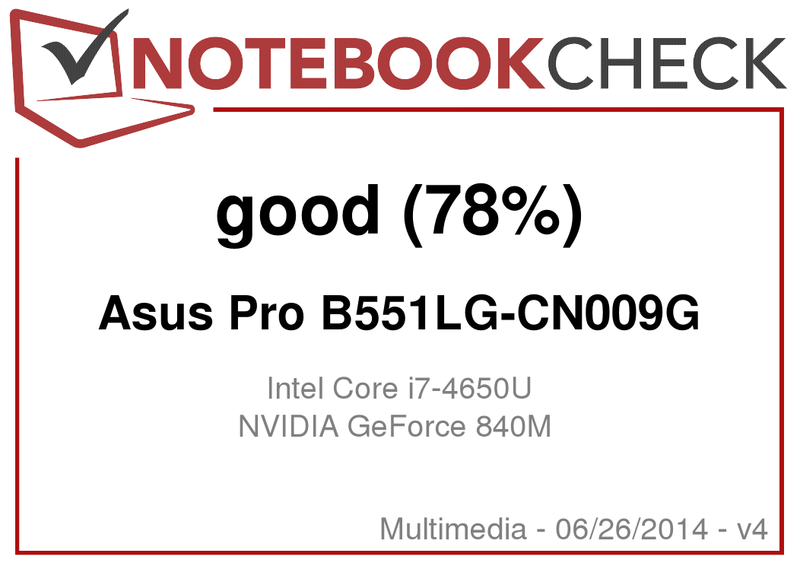 Most recent laptops equipped with an i7-4600U beat the Asus Pro by 5 to 30% concerning the total PCMark 7 score - no matter the GPU. The PCMark 8 results are quite similar. Our real-life impressions are better. Programs (as well as the system itself) start quickly, and even excessive multitasking doesn't bring the system to its knees. The main strength of most SSDs is their fast access times, especially for a large number of exceedingly small and disparate data blocks - a typical requirement at boot-up as well as during program starts. 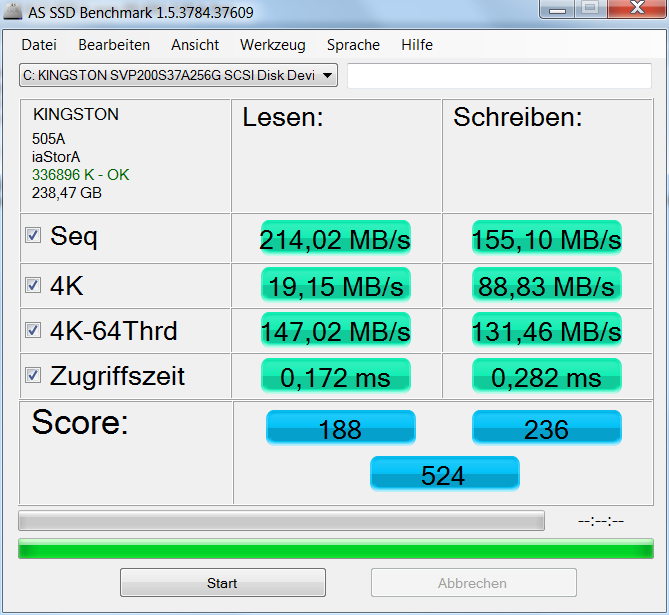 Recent SSDs should manage to achieve at least a 4k read speed of 20 MB/s - something the Kingston SSD used in the Asus Pro barely manages to achieve. Other benchmark results (with incompressible data blocks) yield the same overall impression: The Intel SSD used by the HP EliteBook is far faster, with sequential read rates being more than twice as high - this could e.g. become noticeable when starting games (which often require pre-loading large data files). 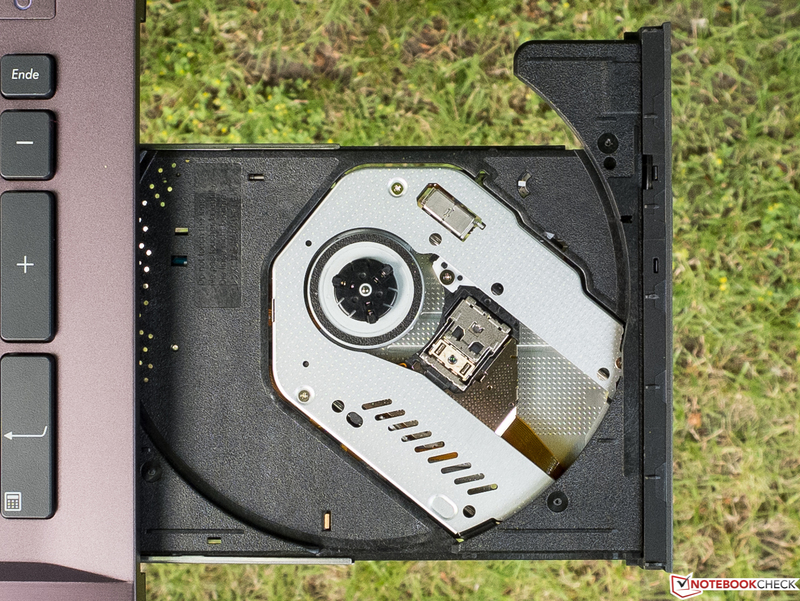 The HDD used in Lenovo's ThinkPad plays in a different (meaning worse) league entirely, as can be seen by looking at the CrystalDiskMark 3.0 results. 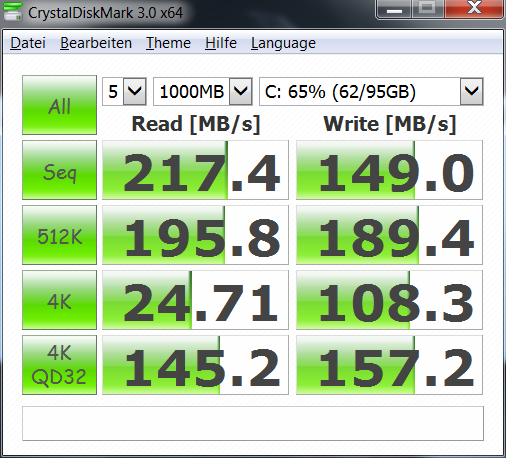 Those who are interested in more HDD and SSD benchmark results can find an overview here. The mid-range Nvidia GeForce 840M GPU with its 1 GB of dedicated RAM has already been presented to the public during March 2014, being one of the first Maxwell architecture models. It comes with both DirectX 11.0 and Nvidia's proprietary programming language CUDA, allowing (a tiny number of) optimized programs to let the GPU solve highly parallelized tasks. 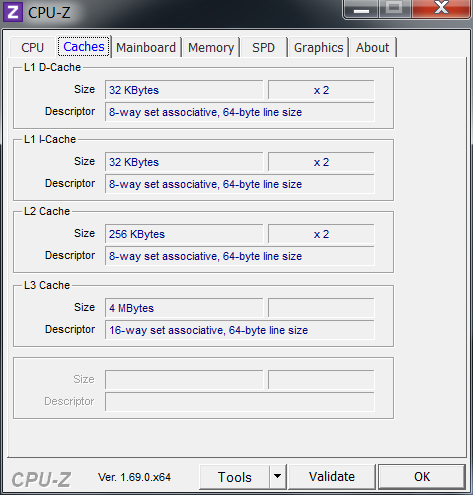 The 64-bit memory interface only allows for DDR3 memory to be connected instead of the much faster GDDR5 RAM. Still, this issue is not quite as severe due to the increased L2 cache being employed by the Maxwell chips. 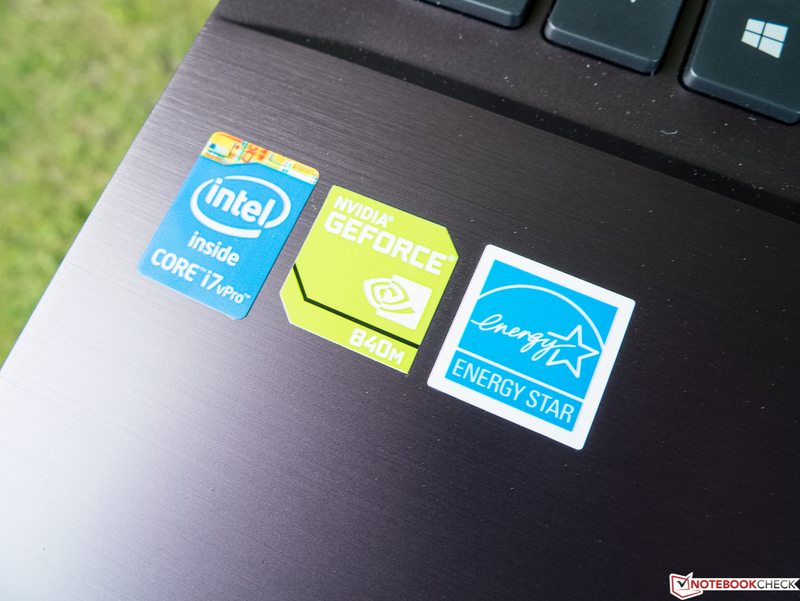 At the time of writing, five other laptops with the same GPU can be found in our database. Looking at their benchmark results it becomes evident that - possibly due to a driver issue - only the integrated Intel HD 5000 GPU is being used during the Ice Storm benchmarks (low loads, DX9, graphics), yielding a much lower score than expected. The Cloud Gate (medium loads, DX10, graphics) benchmark results are more like it, beating its common mid-range predecessor, the GT 740M, by 20 to 30 % in most cases. Thus, most recent and graphically demanding games can be played smoothly with medium-to-high settings - still, this is no future-proof GPU. The AMD Radeon HD 8750 (GDDR5) comes close in terms of performance, especially under less demanding conditions. 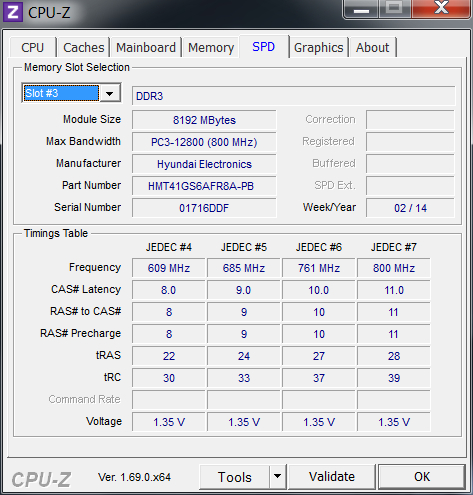 The Radeon HD 8670M, however, falls behind by approx. 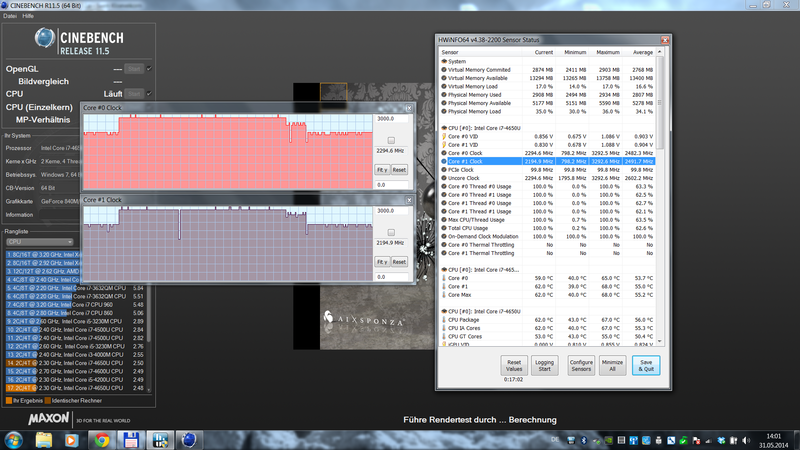 50% during the pure graphics benchmarks. The physics tests show once more the suboptimal usage of the i7 CPU. The fan - although always on - can barely be heard among ambient noise while the laptop is idle. It gets a bit more audible under load (especially when both the CPU and the GPU are active), but there are no jumps in fan volume. Under maximum load, the fan noise becomes rather loud (its 42.7 dB(A) marks pretty much the average value of recent multimedia laptops), but - except for a slightly noticeable high-frequency pitch - not annoyingly so. Our test device only gets really warm during continuous full load at the rear part of the bottom panel. Still, such stressful tasks will rarely occur during real-life usage on one's lap. 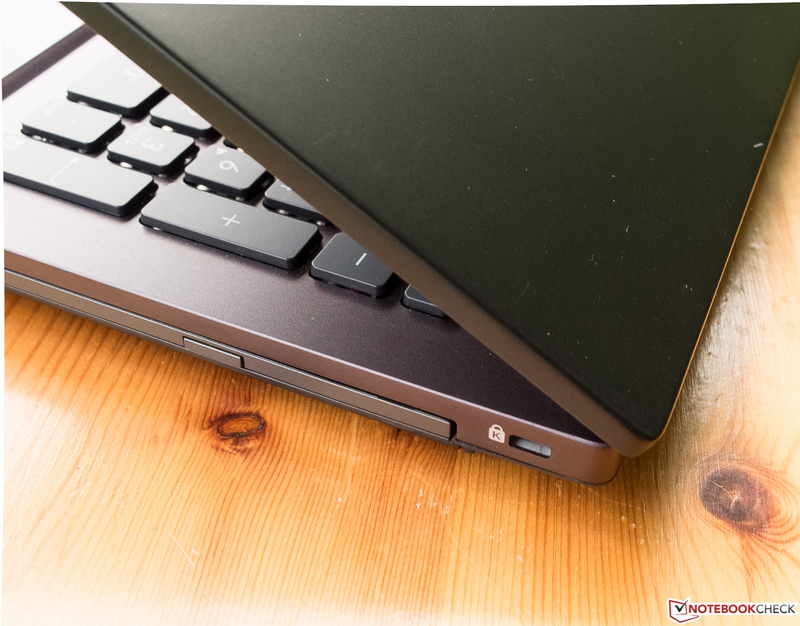 Other parts of the device (such as the palm rest where it is more common to touch the laptop) don't even reach body temperature. While idle, no part of the surface does. Once again, the stress test combining Prime 95 and Furmark shows that Asus is no master of thermal dissipation. The CPU clock speed (of both cores) decreases to 2.1 GHz and even further to 1.7 GHz for short periods of time. 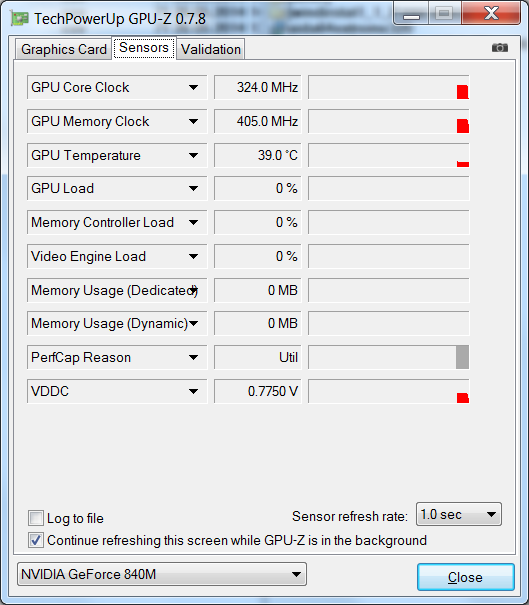 Both the CPU and GPU get hot (89 and 79 °C, respectively), but they remain within their specifications. The presets don't have much effect on how the speakers sound. 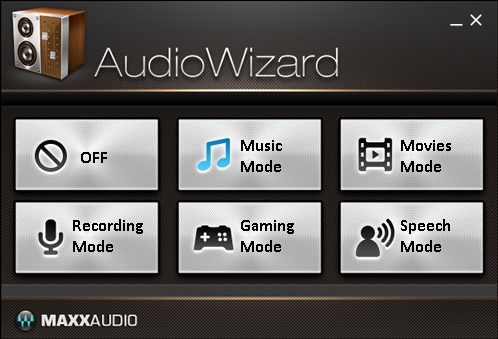 We started by testing the speakers with the "music" preset (see image to the right) and some vocal-heavy titles such as this. Voices sound natural and powerful, albeit sometimes a bit harsh. Mids are over-emphasized, but this helps in making dialogue easier to understand in movies. Bass-heavy music is more of an issue, sounding thin and barely reproduced correctly. Not much in terms of dynamics or spatial effects could be noted. Although the speakers are located at the lower front of the device, aiming downwards, a reflecting surface doesn't help much in increasing the (in our eyes insufficiently low) maximum volume. When turned off, the Asus Pro B551LG-CN009G draws approximately 0.1 watts - this is completely unnecessary, as is the 0.4 watts during standby. 10.1 watts while idle, however, is slightly below average (for this kind of machine), and the results get even better when the laptop is put under full load. 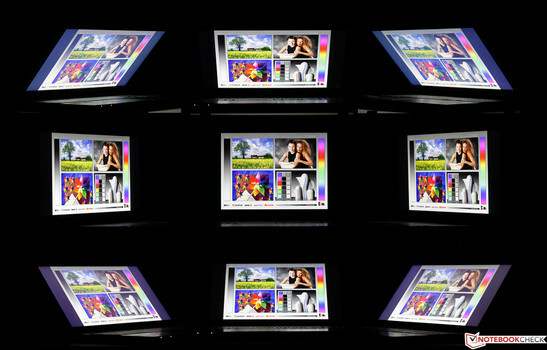 All 15.6-inch laptops which require less power run on far less powerful hardware. Then again, the throttling issues surely help with these results. The power adapter yields 65 watts - more than enough no matter what scenario we are in. 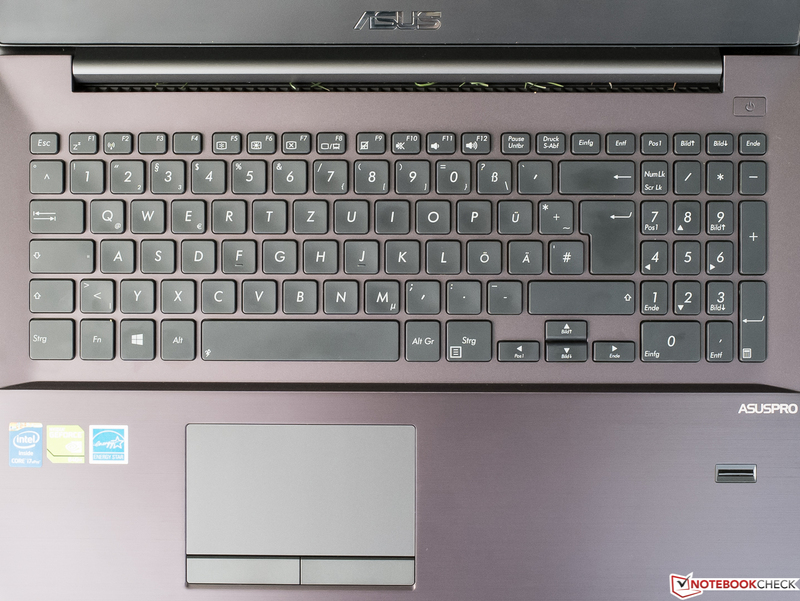 In terms of battery life, the Asus Pro can be compared to recent 15.6-inch multimedia laptops - yielding average runtimes both under load and during our real-life Wi-Fi test. Anyone who is interested in reading up on all the details of these tests can do this here. 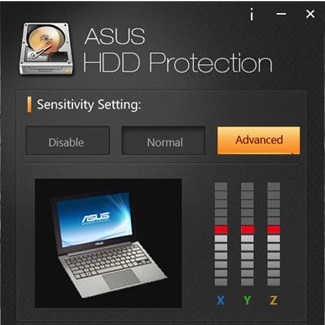 The Asus Pro could conceivably survive for longer stretches of time if the clock speeds while idle were not to remain at 2x 2.9 GHz - an issue which could only be solved by rebooting the system, while it occurred again once a single arbitrary program was opened and closed. This was quite a surprise as no processes producing significant CPU loads could be found by taking a closer look at the task manager. 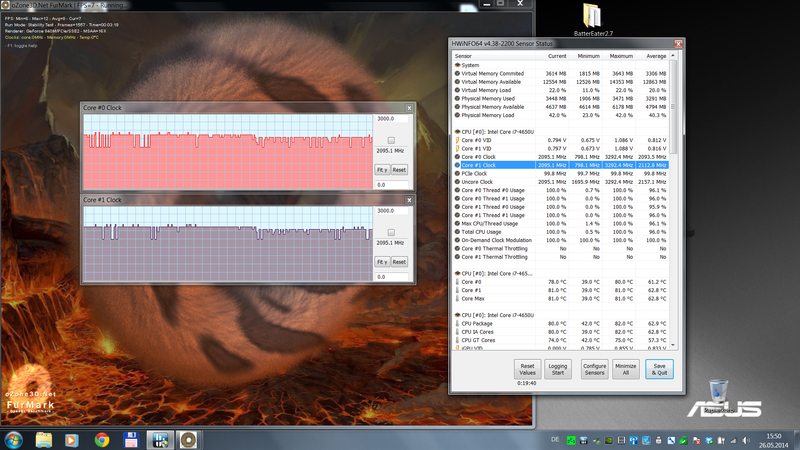 Once more, our second test device (the one with an i5-4200 CPU) behaved normally, reducing its clock speed while idle. Still, the Wi-Fi battery runtime of both devices came to lie close together, with the i5 variant not even exceeding 5 hours instead of 4 hours and 39 minutes for the i7 model. 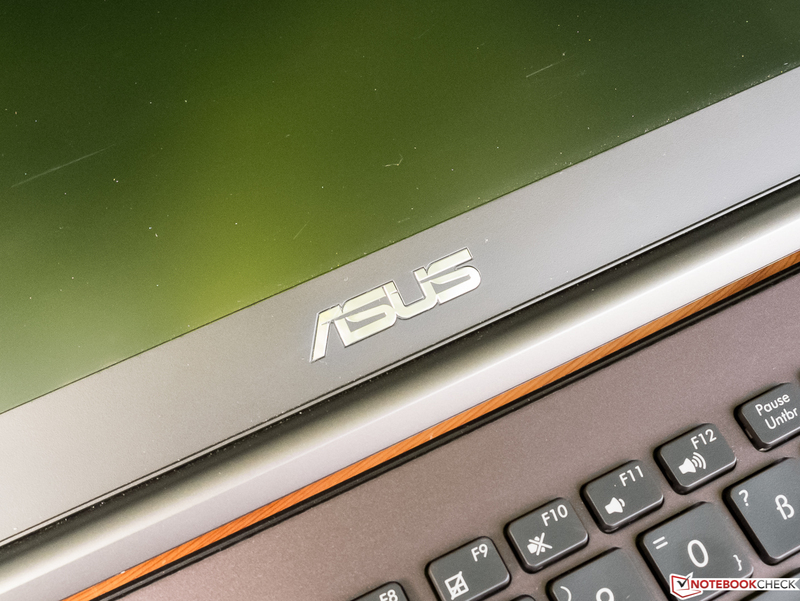 Asus has promised quite a lot regarding the "professional quality" of the Asus Pro B551LG, but at least concerning our first test device, these promises backfired. Sharp edges, a malfunctioning USB port, insufficient CPU performance, issues with its Nvidia Optimus drivers during the Ice Storm benchmark, a rather slow SSD and a subpar numpad - that's quite a list. While our control device could rectify some of these points, other issues remained. Still, the great display, the sturdy chassis, the more-than-decent haptics of the keyboard, the large number of ports and the usable speakers are definitely assets, as are the security features which should suffice for most mobile business professionals - at least those who don't mind the bulky case and the rather high weight. The system and GPU performances should be more than enough to play most recent games (including the demanding ones) with decent settings. 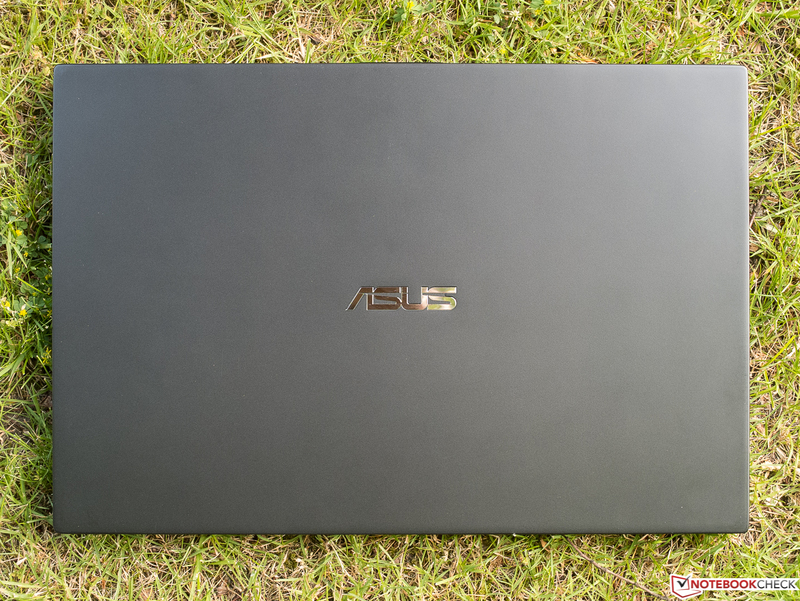 This combination of features is indeed quite unique, separating the Asus Pro from the competition and making the relatively high price feel much more justified. Still, a sour taste remains due to our issues with the first test device. The velvet-like display lid is quite susceptible to fingerprints. ...appears to be either brownish or even purple. ...most of the ports can be found. The maximum opening angle lies close to 180 degrees. ...sticks close to the standard layout. ...and are just a joy to type on. The same does not hold true for the numpad - it's simply too small. ...didn't cause any issues during our test. The SD-card slot is located right beneath the status LEDs. Webcam, microphones, ambient brightness sensor. Optical drives are still very common in multimedia laptops. VGA and Ethernet (slides fully open) sound more business-like. 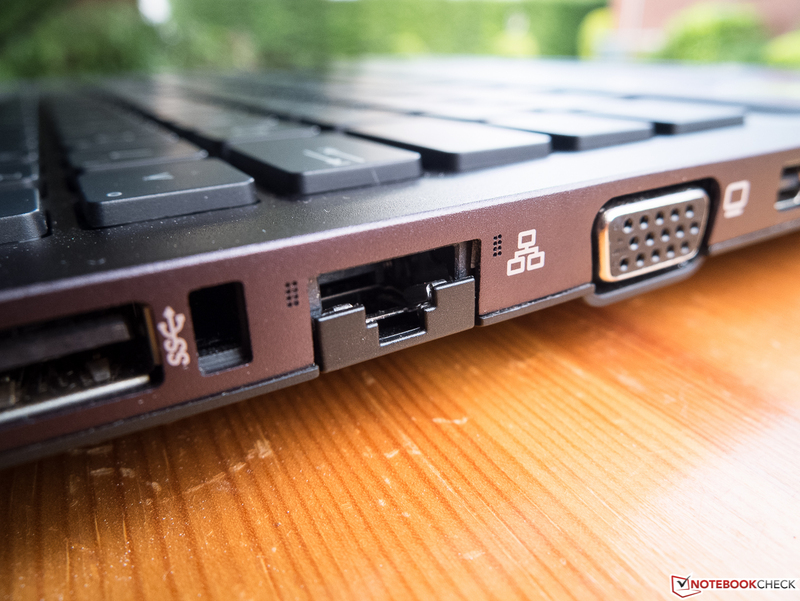 The great variety of ports as well as security features, the nice keyboard and the powerful GPU make for a potent combination. 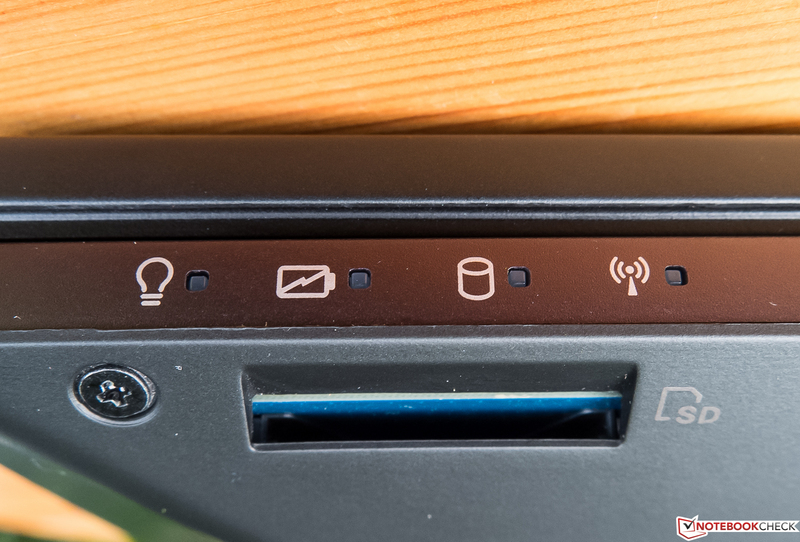 That Asus chooses to send us such a disastrous test device; this is reflected in our verdict.